Update: Additional Colorado cities and counties such as Denver and Pueblo have now signed on to the Compact. Click here to view the current list of signatories. ASPEN, COLORADO - May 23, 2017 – At a City of Aspen statewide climate summit, elected officials and senior staff representing 27 local Colorado governments pledged to initiate a network called the Compact for Colorado Communities, a powerful tool for creating uniform climate change education, action, and policy statewide. The City of Aspen hosted the summit on May 19, 2017 with the goal of strengthening Colorado’s ability to fight climate change. The 27 signatories at the summit pledged to present the Compact charter to their respective governing boards within 90 days, thus formally launching the Compact. The agreement symbolizes a collective commitment to aggressively act on climate change by focusing intently on building decision-making capacity and expertise within local governments. facilitate flow of funding from state and federal agencies, philanthropic organizations and the private sector to city and county programs. 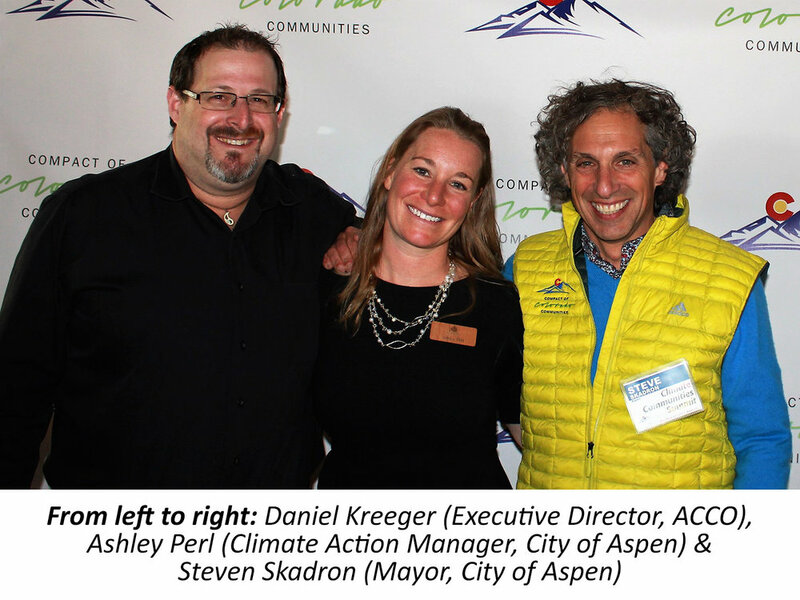 The Compact was activated under the leadership of Mayor Skadron, Aspen’s Climate Action Manager, Ashley Perl, and the Association of Climate Change Officers (ACCO). ACCO played a key role in structuring the Compact’s requirements and will be providing critical climate preparedness training to elected officials and staff in all member communities. Additionally, ACCO will forge partnerships with peer non-profit organizations, state/federal government entities and technical experts across sectors to support the Compact’s members. 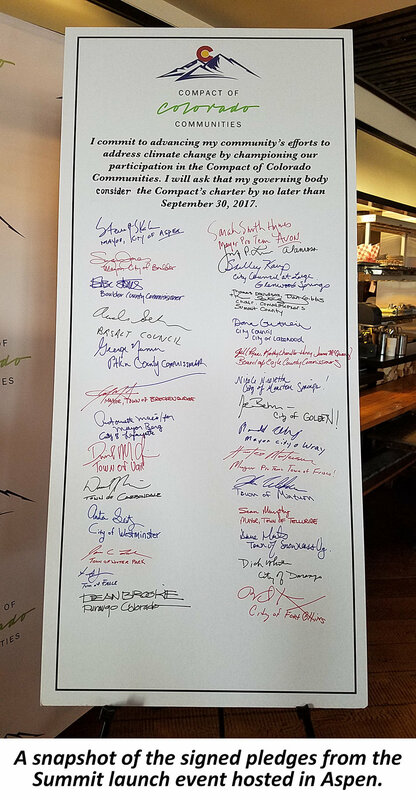 Pledge signatories included elected leaders from 22 cities including Boulder, Vail, Fort Collins, Basalt, Breckenridge, Lafayette, Carbondale, Westminster, Winter Park, Eagle, Avon, Alamosa, Glenwood Springs, Manitou Springs, Frisco, Minturn, Snowmass Village, Golden, Durango, Lakewood, Telluride and Wray, who were joined by Pitkin, Boulder, Eagle and Summit counties. Leaders from cities and counties such as Denver were unable to attend the launch event in person due to inclement weather the day before the event, but participated through a live stream of the event and have indicated verbally that they plan to join the Compact. Colorado communities have already faced very significant climate change impacts and extreme events including shortened ski seasons affecting the economy, significant flood events and increased wildfires destroying real estate and infrastructure, droughts that have significantly impacted the agriculture sector, and pine beetle infestations that have ravaged trees statewide. Significantly expanding professional competencies and informed leadership in local governments will better prepare Colorado for climate change and extreme events while growing its economy. For a complete list of participants and to learn more about the Compact of Colorado Communities, please visit http://Colorado.ACCOonline.org. Founded by Aspen Mayor Steven Skadron and the Association of Climate Change Officers, the Compact of Colorado Communities has been established to bring cities and counties together to stand together in taking constructive and practical climate action. The Compact will dynamically advance and expand upon city and county efforts to address climate change, resilience to extreme events and grow a clean energy economy throughout Colorado. For more information about the Compact of Colorado Communities, please visit http://Colorado.ACCOonline.org. Located high in the Rocky Mountains, Aspen is the 53rd largest city in the state. Two hundred miles southwest of Denver and 130 miles east of Grand Junction, it is at the southeastern end of the Roaring Fork Valley. Aspen is surrounded by the White River National Forest. The City encompasses 3.66 square miles and is a relatively flat valley floor surrounded on three sides by Aspen, Smuggler and Red Mountains. It was founded in 1880 and incorporated in 1881. Aspen is internationally renowned as a winter and summer resort. The Association of Climate Change Officers (ACCO) is a 501(c)(3) non-profit membership organization for executives and officials worldwide in industry, government, academia and the non-profit community. ACCO’s mission is to define, develop and support the functions, resources and communities necessary for effective organizational leadership in addressing climate-related risks and opportunities. ACCO administers the Certified Climate Change Professional® (CC-P®) and Certified Climate Change Officer® (CC-O®) credentialing programs. For more information about ACCO, please visit http://www.ACCOonline.org.